After closing above 2,100 for just the third time this year, the S&P 500 is now up 3.0% for the year and only 1.2% away from a new all-time high. That is on a price-only basis though, as if you look at the S&P 500 total return (including dividends), it closed at a new high yesterday. For a refresher on total returns, we talked about the hidden value from dividends in this blog post from April. 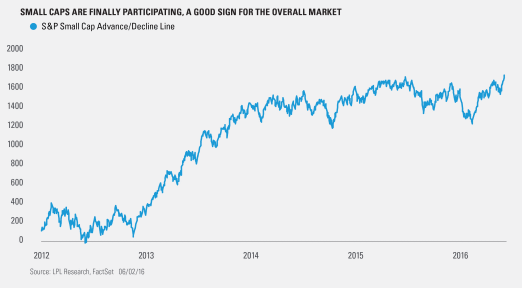 Besides the new all-time high in the S&P 500’s total return, market breadth, the number of stocks participating in a rally, continues to be a major positive to the bullish case. One of our favorite ways to measure market breadth is by using advance/decline lines of various indexes. The computation is rather simple: it is based on how many stocks were up or down for the day, and then computed on a daily and continuous basis. The thinking is that higher moves in an advance/decline line show strength under the surface of a rally. The flip side is that a weak advance/decline line could mean something is wrong under the hood. Think back to last year at this time, all we heard was how bad the breadth was. Only the FANG stocks (Facebook, Amazon, Netflix, and Google) were leading. With that weak underpinning, eventually things cracked to the downside in August. The good news is, we have nearly a total opposite technical backdrop this year. New all-time highs were made yesterday in multiple advance/decline lines, including the S&P Mid Cap Index, the Nasdaq 100, the NYSE, the S&P 100, the S&P Small Cap Index, and the S&P 500 itself. That is a wide-ranging show of strength for various sized companies, which only strengthens the overall bullish case. The one that caught our attention was the small cap advance/decline line making a new high. Small caps have lagged the past few years, and although we still don’t expect major outperformance from this group late in the economic cycle, it is a major plus to have small caps finally pulling their weight. Historically, strong small cap performance has often indicated investors’ willingness to hold riskier assets, and recent outperformance could be a sign for overall market strength coming. Strong market breadth is a step in the right direction to finally break out of this historically tight range the S&P 500 has been for in the past 22 months. It is important to note that there can and will be pullbacks though, with new highs in advance/decline lines. Although we would expect any weakness to be relatively contained, a pullback as much as 10% or so is certainly possible. But as we explained in this week’s Weekly Market Commentary,any further volatility in the coming months could present a nice chance to buy the dip. The S&P 100 Index is a subset of the S&P 500 and includes 100 leading U.S. stocks. The S&P Mid Cap Index measures the performance of midsized companies. The S&P Small Cap Index measures the small cap segment of the U.S. equity market. The Nasdaq 100 Index includes 100 of the largest domestic and international non-financial companies listed on the Nasdaq Stock Market based on market capitalization.